This persistent myth has been making the rounds for decades. Often a corollary comes with it: people slept sitting up because of the short beds. The answer is complicated. Early American beds were made individually; there was no standard size. Some beds, especially those for children or teens, were shorter than today’s. Some were longer. Some people may have slept propped up on pillows, just as they do today, but beds were not made shorter because of that. Visitors to historic houses are often surprised if the tour guide takes a measuring tape to a “short” bed and they find it is as long or longer than today’s standard 75” double bed. 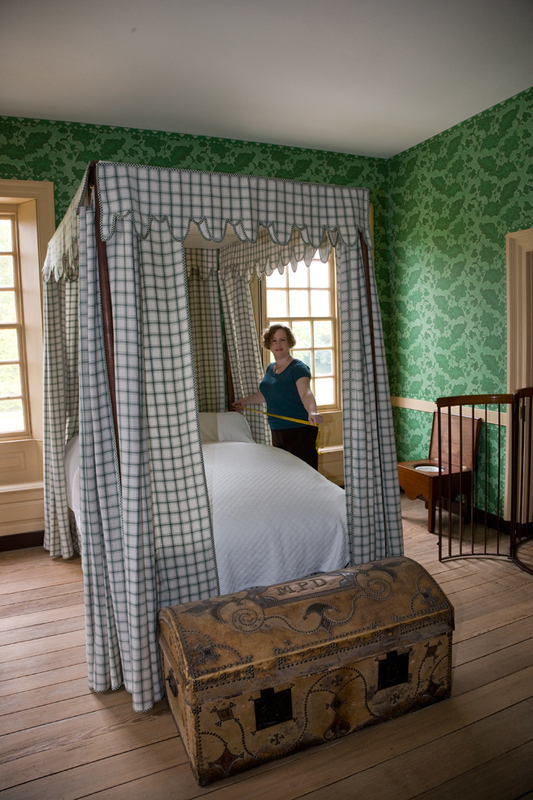 In 1981 Colonial Williamsburg curators surveyed the antique beds in the exhibition buildings and found that all of them equaled or exceeded 6’3”, the standard double or single bed length today. Some are as long as 80”, the length of today’s king or queen size. Moral: measure your antique bed first, then you can tell whether it is shorter or longer than modern examples. So why do we think the beds are shorter? Because they look shorter. The high bed posts, fabric hangings, canopy, and plouffy mattresses make beds appear shorter in comparison than they are. And these beds are often situated in rooms with very high ceilings and large dimensions, which makes the beds appear small in a big room. As for the short people, heights varied in the eighteenth century as much as they do today. But overall, people in the colonial era were not dramatically shorter than today. When Colonial Williamsburg historian Harold Gill compared the average heights of white male soldiers during the Revolutionary War in the 1770s to those serving in the US Army in the 1950s, the difference was only about two-thirds of an inch. Other similar studies have shown similar results. The Museum of London had a recent exhibit (thank you, Francis Classe, for the info) trying to debunk this same claim. They said that on average, people in medieval times were only 2-3 centimeters shorter than people today. An article in a 2010 issue of the Economist supports this–there is a long article about medieval warfare based on excavations into a mass grave of soldiers killed during the War of the Roses and in the section subtitled “Who are you calling short?” the author says that medieval men averaged 1.71 meters tall, just 4 centimeters shorter than a modern Englishman. Interestingly, the average height of colonial American males does seem to have been significantly greater—up to 2 inches—than the average height of European males of the same time (colonial period), a result ascribed to better nutrition and healthier living conditions (fewer crowded cities with killer epidemics and diseases) in the New World than in the Old. More recent studies have shown that in the past half century, the average height of Americans has, indeed, increased. Comparing soldiers from the American Civil War, who averaged 5′ 7 1/4″, with today’s average for men, 5′ 10 1/2″, shows an increase of over three inches, most of which occurred in the last fifty years. Did beds become larger in the last half century? Well, no, bed lengths didn’t change, but their relative popularity has. Ever since the 1960s, queen-size and king-size beds, with their extra 5 inches in length, have become increasingly popular to the point that the queen is now the bed of choice for most couples. It is rare for a mattress store to sell a plain double bed, something that used to be the standard for married couples. This is due at least as much to the increased weight of Americans as it is to any increase in height. This entry was posted on Sunday, March 23rd, 2014 at 8:20 am and is filed under Furniture and Furnishings. You can follow any responses to this entry through the RSS 2.0 feed. You can leave a response, or trackback from your own site. 12 Responses to Revisited Myth #8: Beds were shorter back then because people were shorter. People of the Abyss, by Jack London, discusses Londoner’s shortness due to poor nutrition. and their descendants, the grandkids often tower over their grandparents. I always figured this was due to better food here, and the grandparents perhaps emigrated to get a better life, which included better nutrition..
That goes along with what I wrote in the second-to-last paragraph above. Better food, yes, but also healthier environment, less of the population crowded into disease-ridden, polluted-water cities and more in the fresh-air, clean water country. Part of the reason is that people are used to hearing stories like how Abe Lincoln was so tall. Then they find out he was 6’4″ and say, “That’s not tall at all by today’s standards!” And it’s not. The “Long Nine” would not stand out today for their height. I also think that the lack of standardized mattress sizes may have contributed to the “look” of shorter beds. – a thinly stuffed mattress that doesn’t really fit (in our observation) would make the bed appear skimpy and short. Also, it was much easier to insert different side pieces to make a longer or shorter bed. Antibiotics in use since the 1940’s have caused a spurt in human growth/obesity according to one study. Also see NYT piece: http://www.nytimes.com/2014/03/09/opinion/sunday/the-fat-drug.html. I disagree with her interpretation of the facts. After reading this article, I find that she has directly proven the exact opposite. As she herself points out most of the antique adult beds were roughly about the same size as modern full size beds but on average today adults use at least a queen sized bed which is a full 5 inches longer than a full size. She also goes on to point out that the average American male is 3 inches taller than 100 years ago and that on average Americans are taller than their European precedents. So quite clearly we are in fact taller now and in fact use longer beds. It might not be a huge jump in numbers but percentage wise and considering the short time of this transformation I argue it is significant change. It is only a matter of exaggeration and interpretation of these facts that might be questionable. And interpretation is very individual. I meant to say predecessants not precedents. The spirit of the myth that we are taller and have longer beds is completely valid I find this author has over exaggerated the myth in an effort to be able to be contrary and to have a myth to debunk. Instead she proves its validity. I was wondering if information on the size of colonial blankets and coverlets and most especially locally made quilts would be helpful here.. if their length were considerably shorter than “modern’ blankets we might get an idea about the size of the bed for which the blankets were intended.. I dunno about this. I remember that when I visited Monticello, Old Tom’s bed looked really small to me. While visiting Ohio recently I got to tour the Patterson house and the Johnston house and farm and many of the beds seemed shorter to me. There were tall people then and there are tall people now, and short people then and short people now. But I still think the percentage of people that are taller is higher now..